If you need help deciding what kind of instance to create, take a look at our MongoDB Overview! Select MongoDB for the service. 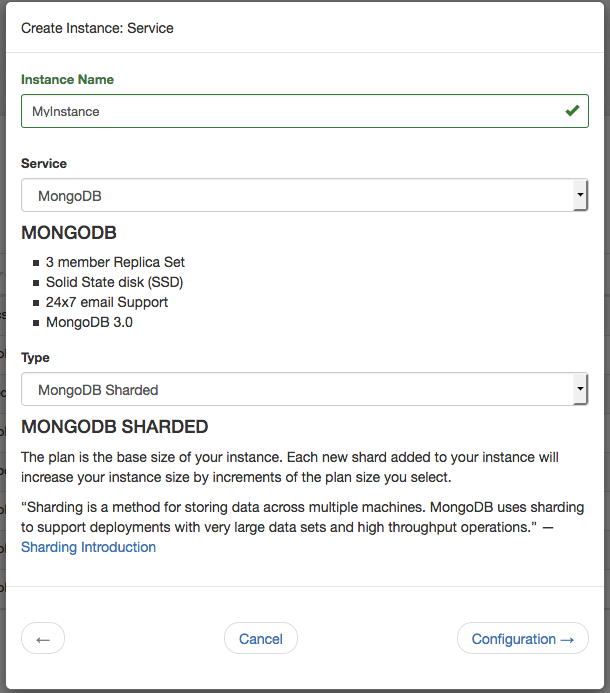 Choose either MongoDB Sharded or MongoDB Replica Set. Each selection includes a brief description, and more information can be found on our MongoDB Overview. 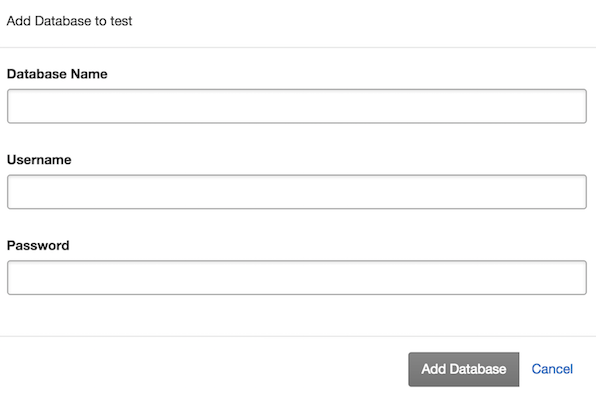 We offer the latest version of MongoDB 2.6, 3.0, 3.2, with 3.4 in Early Access. If you select 3.0+, you can also select either WiredTiger or MMAPv1 as a storage engine. Select a zone that suits your needs. Consider that as you grow you always add shards in your plan size when using a Sharded instance, but that isn’t possible for a Replica Set. For more details, check out plans and pricing. Select a storage engine (3.0+ only). 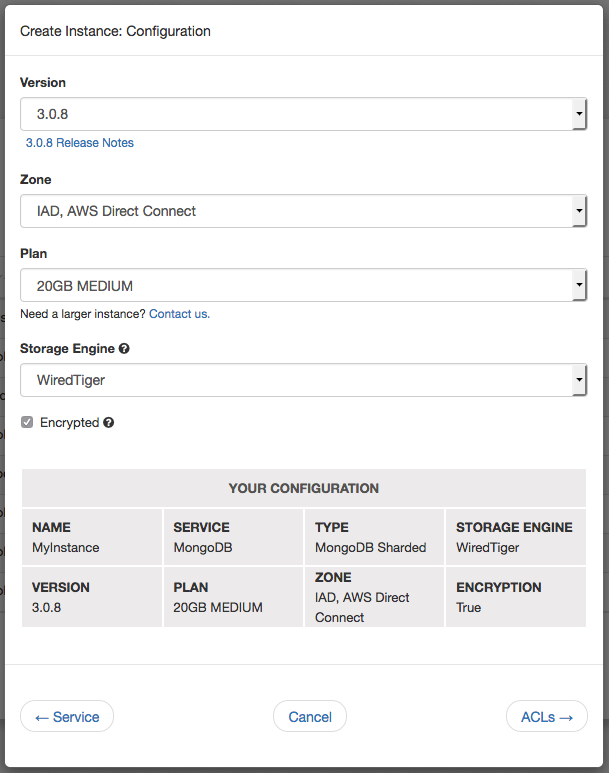 You can select WiredTiger or MMAPv1 for your storage engine when deploying MongoDB 3.0+. If you choose our WiredTiger engine you’ll have a plan size minimum of 20GB. You can choose to encrypt your data at rest and any backups for this instance. Click on ACLs to continue. Access Control Lists (ACL) limit what IPs connect to your instance. You can click the Add My IP or Allow Any IP to have our system automatically add those options. 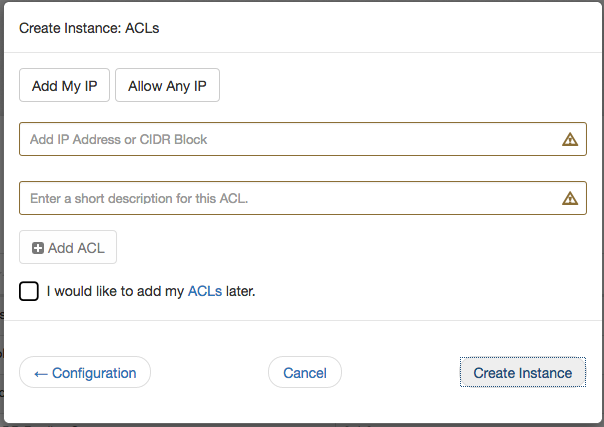 Once you’ve added at least one ACL, or deferred to add one later, you can click Create Instance to finish. Instances you create appear under the Instances heading. Click the instance name to view its details and available operations. Many operations are available; to begin, let’s create a database. After selecting the desired instance, scrolldown to the Databases section. Enter a name, username, and password, then click Add Database to confirm. Database users by default have full privileges to the specified database. You are able to create collections and indexes, as well as, read and write documents. However, by default, they cannot perform administrative commands or interact with databases outside of itself. You can also add collections or more users with this interface by selecting the database name, as well as by using the ObjectRocket API or MongoDB shell. Prior to 3.0+, the Mongo shell does not support SSL connections unless you compile it manually with SSL support. If you see something similar after running show collections, you’re connected to the instance and can perform database operations. Success! If you encounter any issues or just want some guidance, please reach out to our support team!